Meghalaya Chief Minister Conrad Sangma attended a progarmme “Celebrating the Shillong-Sakura Connect” – Idea Exchange on Socio Economic Partnership. 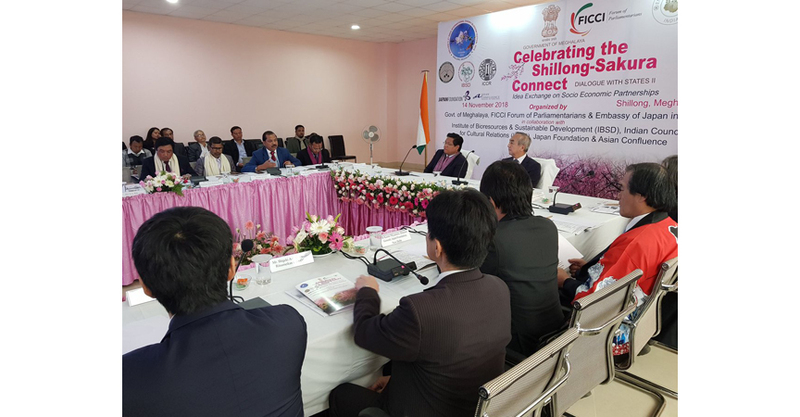 The meet which was held at Shillong, was organized by Meghalaya government, Federation of Indian Chambers of Commerce and Industry (FICCI) Forum of Parliamentarians and Embassy of Japan in India. It was organized in collaboration with Institute of Bioresources & Sustainable Development (IBSD), Indian Foundation for Cultural Relations (ICCR), Japan Foundation and Asian Confluence. Apart from Conrad Sangma several key dignitaries from both India and Japan were present. Issues like boosting trade and industrial development of Meghalaya and Japan, providing employment and improving livelihood for the people of Meghalaya were discussed. The second meet of “Japan-India Act East Forum” held in October at New Delhi, focused on improvement of northeastern regions. Japan International Cooperation Agency (JICA), a government agency of Japan held a meeting with the Meghalaya State Planning Board in Shillong in April in order to fund socio-economic projects of Meghalaya. The study team from JICA focused on the development of healthcare, infrastructure, education and livelihood development of Meghalaya.